A break from PhD land and essay writing for the MEd in Academic Practice for Easter (I’m in a prison house of language at the moment)…spending the day in a very familiar land – Liverpool and Merseyside in the North West of England. I spent a lot of time there as a child as my grandparents lived in Formby and Southport (I miss them everyday), and as I used to work as an Information and Education Assistant at the one and only Tate Liverpool nearly ten years ago. It seems like only yesterday. I still have my magnetic ID badges in a tin in my bedroom. Here’s to career nostalgia making me realise how far I’ve come. I forget sometimes, especially at the moment in my world of words. The afternoon of Good Friday was spent clearing the mind, lungs and cobwebs from the soul on Crosby Beach with Antony Gormley’s sculptures ‘Another Place’. ManaXi, his elder brother and I got the train to Hall Road and walked south along the shoreline to Blundellsands. Quietly content, hit by blazing Spring sunshine reflecting on the water, we wandered through the muddy sands arm in arm. I swear as I was born by the sea, whenever I return to it, on any coastline in the world, I become immediately happy. The simplicity and accessibility of Antony Gormley’s sculptures have a global resonance and accessibility…and seemingly translate wherever they are in the world, most recently installed in Hong Kong, precariously on the edge of Hong Kong’s tallest buildings. The main reason we were in Liverpool was for the opening of a group exhibition where manaXi’s cousin – Chloe Manasseh – was exhibiting. The first time I saw Chloe‘s work was in London on what was manaXi and I’s second date…a date that was decided through selecting one of three handmade cards. Each contained a different date and destination. It was not long after her graduation from the MA Fine Art course at Slade, UCL…and even then left me with a lasting impression. In Liverpool, Chloe’s work was part of the group show ‘Fruits of the Lûm‘ at CBS Gallery (the gallery at Crown Buildings Studios) in the Crown Building, Victoria Street, Liverpool. It is the first exhibition curated by the curatorial duo Tžužjj (Louis Palliser-Ames and James Harper) where ‘Fruits of the Lûm‘ looks at ‘ideas of commerciality within contemporary art and how commerce might necessitate certain changes to an artist’s process of making. The title of this project is a playful reference to popular branding (I remember it well from growing up in the 1990s) whilst also nodding to the French word for ‘light’ and cinematic pioneers, the Lumiére brothers. It was their invention of the film projector that allowed them to fulfill their desire to share with the world. These sentiments are echoed by Tžužjj through a desire to bring exciting artists into public consciousness. The exhibition is to be considered as ‘a gentle introduction to future intentions of Tžužjj‘ and I look forward to seeing their art offerings. Chloe‘s paintings dominated the space as colour punched through, drawing your eye to her corner utopia within the gallery. 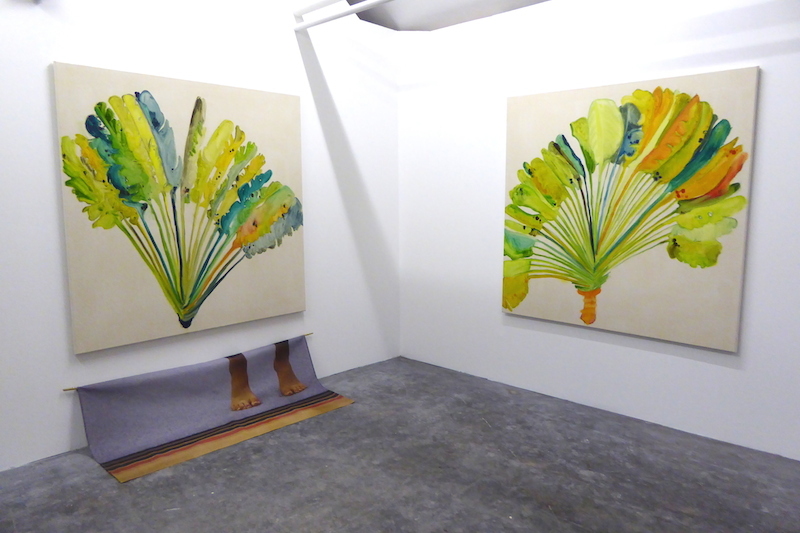 The palms confidently mark the space as if male peacocks fanning their feathers – an escape to a foreign tropical land – whilst bringing into question the pair of anonymous adolescent ankles and feet under the left-hand side canvas. Why do you stand here and where will you go? This work, entitled ‘In Dreams I Run Wildly’, is a film still taken from her latest artwork produced during a residency at South Hampstead High School, London. She has been documenting the feet of students during activities in the school’s gymnasium, feet that stand on the edge of the mat on the precipice of the wooden floor. Will they take the step forward or remain on the warmth and familiarity of the mat? An ode to aspiration and taking the next step in life, this film still denotes a hope for overcoming fear, the fear of the future, placed under Chloe’s own security and signature paintings of palms. I’m wanting more of the video piece now. Another noteworthy piece from the exhibition was ‘Drawing a Blank’ by LA artist Adam Ferriss…obsessional mark-making that intrigued every viewer. It is created by a “neural network” trained on a set of 5,000 drawings by Adam made over a two week period. The network devises a way to draw in the style of Adam’s hand, an algorithm that also manages to deviate from Adam’s personal style. The projection is refracted through a magnifying glass where the final animation hits a piece of white paper no bigger than a 2p piece. It represents what the artist calls “latent space” in your learned neural network through datasets and drawings…playing with the tensions and relationship between human and digital, unconscious and subconscious, predictable and premeditated, impulsive and intuitive and more. Hypnotising intimacy. Works ‘Pores & Claws’ by Holly Hendry interrupt the architecture of the top floor of the Crown Building…curvaceous free-standing sculptural abstraction with absurd sterile points of comfort. Their carpeted surface and fragile plaster casts of cushions are to act ‘as barriers to be navigated’. Resembling what the artist calls body aids, gym equipment, massage tables and domestic interiors, they are to begin a dialogue about the affected body, affected by the interior. I would have liked more disjunction and less fluidity in the lines…cutting into the space as if a spear in flight rather than continuity and endless negotiation as the structures were complete in form, ironically with no function. On the left hand wall of the gallery was Jake Laffolley‘s phone number (not his personal number)…an artwork that manifests itself through dialling and (non)dialogue. ‘T.T.C.T.S.C.’ continues Jake’s work through the fictitious company ‘Toilet Time Compression’ with its new ‘Telephone Solution Centre’, a company that aims to increase workplace productivity by limiting people’s time spent in the toilet to 2 minutes (not sure how the latter is relevant as a concept). In ‘Fruits of the Lûm‘, he is advertising the newly opened phone lines for the company where you are invited or expected to dial. An American voice introduces the service over background elevator music placing you immediately on hold. A familiar territory when having to telephone any service industry or cold calling nowadays. You are given 4 options that lure you into thinking there will be an open dialogue, response or resolution, when instead you’re given no clarification and you feel like you are going round in circles. A comment on the non-dialogue of the everyday that I feel the artist needs to make more complex as if a maze or puzzle of life’s dialling option numbers. I’m interested to see what comes of CBS Gallery and Tžužjj in the future having been given an introduction to their studio life, gallery and curatorial practice. I was interested to see that they are trying to place themselves within, and infiltrate, the wider contemporary art scene in Liverpool with lightbox installations at venues Tate Liverpool, Liverpool Biennial Offices, Open Eye Gallery, The Royal Standard and on home turf in the Crown Building.